I must have changed my mind at least four times before deciding to bring this Pear-Walnut Salad to last night’s holiday potluck. What put me over the edge was the sight of perfectly ripe pears sitting on my kitchen counter. My in-laws sent us a box of Harry and David pears — if you’ve ever tried them, I’m sure a ripe Royal Riviera is one of your favorite bites of the year too. My paring knife slid straight through them effortlessly, their juice rushed to the surface. I had to share these pears at their peak! There was a recipe card inside the box for this salad, although it was sized for individual servings. 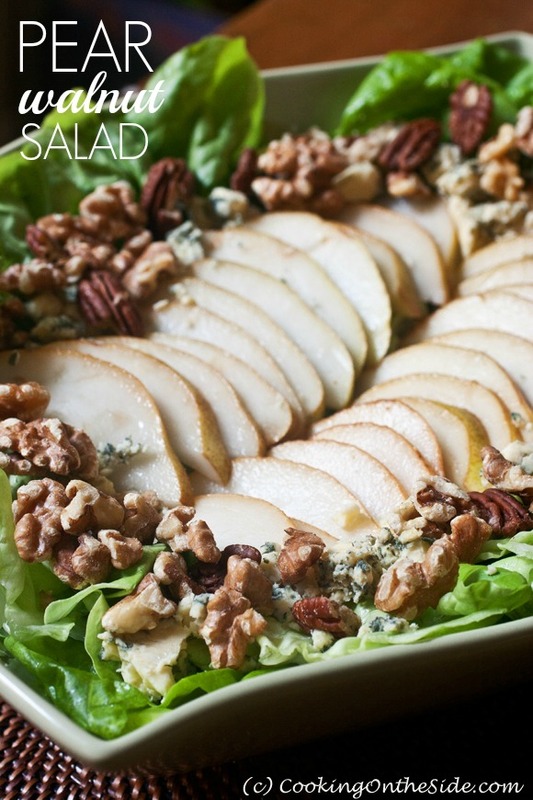 For my potluck, I just served it in a large salad bowl, doubled up on the lettuce and adjusted the pear, blue cheese (I used a Stilton) and toasted nut quantities according to my taste. I’ve had many salads like this before, but the perfect pears made this one extra delicious. I did make a special trip to my local olive oil store for the nice champagne vinegar and walnut oil that the dressing recipe calls for (the aromas of that walnut oil were incredible! ), but I think it would also be very delicious with white wine vinegar and regular extra virgin olive oil. Whisk together the first five dressing ingredients. Gradually whisk in the walnut oil. Gently tear the lettuce into bite sized pieces. Arrange on four chilled plates. Place fans of pear slices on lettuce. Crumble blue cheese evenly on top. Drizzle the dressing generously over the salad. Sprinkle with nuts and serve at once. I’ve been thinking of this salad since I saw you post it on Instagram last night 🙂 I actually bought ingredients to make one similar today — I’m so glad you posted this because I wasn’t sure about the dressing. Beautiful salad Kathy! Oh awesome, Aggie! Hope you love it too! Love this combo for a salad!! Fresh and gorgeous! You can’t get much better than that!! We had this salad last night. The dressing really makes this salad. The Harry & David Pears were great, too! I really like that dressing too! Now that is a gorgeous salad! I love that it was easily adapted to be shared at a potluck, too.